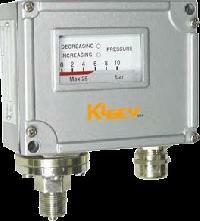 Operating from Singapore, we are a leading exporter and supplier of variants of Pressure Switches. The two variants of Pressure Switches exported and supplied by us include Differential Pressure Switch and Diaphragm Pressure Switch. These switches are manufactured in accordance with the various industrial norms and standards and are completely safe to use. Since we are one of the top-most exporters of these switches, we are capable of handling bulk orders from our clients.